Saturday, December 8th – Emerging Designer Competition and Vendor Market Event at the Fashion Square Mall Downtown area. This show will compose of 10 US Designers that will be competing in a chance to be a part of the global designer showcase on Sunday, December 9th. The winner will receive global exposure to potential store buyers, media, press, and local merchant that will provide a greater platform for the emerging designer. The Emerging Designer Competition will be from 12 p.m.- 2 p.m. and the Vendor Market Expo is between 10 a.m. – 6 p.m. during mall hours.There will be a celebrity guest host joining our judges panel. The Vendor Market/Emerging Designer Competition is free and open to the public. Sunday December 9th – “Poise Affair at the Soiree” by TakayahAin Designs starts at 5pm and is hosted by TV Host, Royce Ashcroft. Showcasing 15 couture looks only available for the V.I.P. guest. The Poise Affair will include complimentary butler-passed horderves and a personalized-signature TakayahAin beverage. The Grand Finale Event will take place at the Amway Arena. 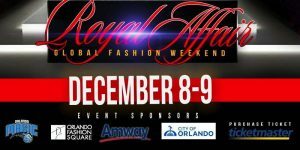 This year theme is a Royal Affair bringing royal-high fashion to the Orlando Market. The Royal Affair Showcase begins at 7pm Doors open at 6:30pm. At the Royal Affair, the show consist of 4 spotlight designers and boutiques and our International Showcase features 4 World Class Independent designers. This will be a buyer showcase in order to market their brand to potential buyers. This event is perfect for the holiday’s season. Bringing a new fashion market to the City of Orlando.